He’s got this: Joachim ‘Jockel’ Winkelhock clamps his starting number onto the bumper of the Opel Kadett B Coupé Rallye at the 24th ADAC Hessen-Thüringen classic car rally. Joachim Winkelhock is a three-time winner of the German Touring Car Championship and also won the legendary 24 Hours of Le Mans in 1999. 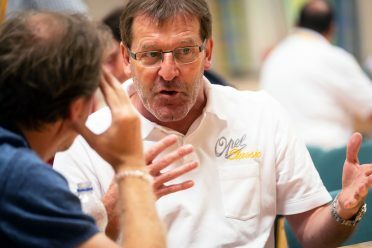 In an interview, the 57-year-old talks about his role as an Opel brand ambassador and why he enjoys vintage rallies so much. Long-term relationship: Winkelhock has been making the rounds as an Opel brand ambassador since 2004. Opel Post: Hundredths of a second can often mean the difference between victory and defeat, as you know from your career as a racecar driver. Can you participate these days in a vintage rally without getting all worked up? Joachim Winkelhock: Yes. That’s what I like about it. The whole thing takes place in a relaxed, friendly atmosphere. It’s the exact opposite of what I used to do. There would be nothing but stress on the weekend of a race. Now I just enjoy it. This is my fourth time at this rally, and there will be five or six more vintage rallies for Opel this year. I always discover beautiful new places I’ve never seen before. For example, this is my first time in Weimar. Before now, I had only ever known about it from history class. We live in a beautiful country and we should always to remind ourselves of that. You have been an Opel brand ambassador and driving instructor since 2004. What exactly do these jobs entail? 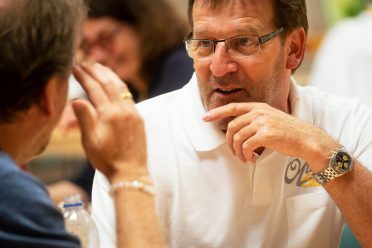 I am the head of OPC driver training in Dudenhofen and accompany the journalists during vehicle presentations, among other things. And I represent the brand at vintage rallies. It’s really wonderful to be able contribute this way as a former professional. I get to tell how amazing the cars are over and over again. 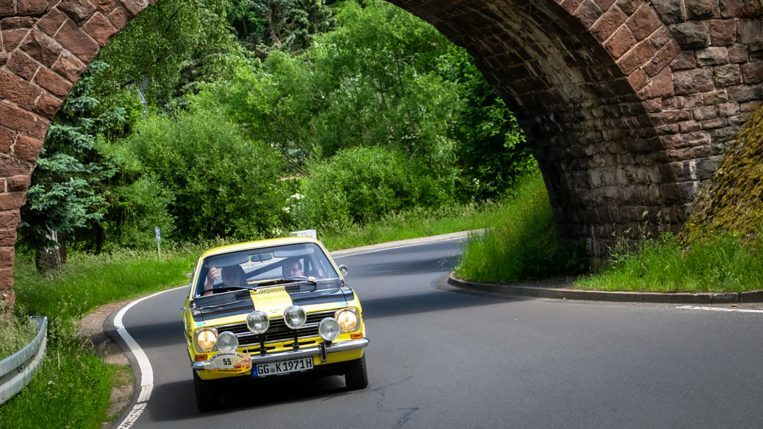 A scenic drive: The 24th ADAC Hessen-Thüringen classic car rally makes its way through the Thuringian Forest and along the region’s porcelain route. What is your favorite model at the moment? The Insignia. The new one is even more dynamic and innovative. I appreciate comfort to a certain degree, but I’m a racecar driver at heart. That means I have to be really in tune with the car. When I have my hand on the steering wheel, I have to feel the car. This is what I get with the Insignia, especially with the sporty GSi version. Does the racecar driver in you sometimes come out while you’re on the highway? Not so much. And I’m not just saying that. If the coast is clear, I put the car through its paces. But it’s really easy to get your driver’s license taken away these days. I’m also slowing down a bit as I get older. I’m well aware of what can go wrong. My parents had a towing and salvage service, which I ran myself for ten years. I saw so many terrible things during that time, and that made me conscious of the fact that even though 100 km/h is not that fast, if you lose control of it, there is a tremendous amount of energy generated in a car that weighs nearly two tons. Unfortunately, a lot of people don’t know this. Once you crash, it’s too late. An expert in his field: The Opel brand ambassador loves to share his vast experience in motor sports and cars. Bobsled pilot André Lange did 150 down the Eiskanal. What was the fastest you ever drove on four wheels? Mister Winkelhock, thank you for this interview.